Lavender (Lavandula angustifolia) has a scent that’s a wonderful blend of fresh, floral, clean, and calm. It’s this dynamic aroma that has made the flower a classic for perfumes, soaps, fresheners, and beauty products. Its Botanical Name is Lavandula angustifolia / Lavandula officianalis. Properties of lavender essential oil - Analgesic, anticonvulsive, antidepressant antiphlogistic, antirheumatic antiseptic antispasmodic, antiviral bacteriacide carminative cholagogue cicatrisant cordial cytophylactic decongestant deodorant detoxicant diuretic emmenagogue fungicide hypotensive nervine restorative sedative splenetic sudorific vulnerary. Blends with - Bay, bergamot, chamomile, citronella, clary sage, geranium, jasmine, lemon, mandarin, nutmeg, orange, patchouli, pine, thyme, rosemary. Constituents - a-pinene, limonene, cis-ocimene, p-cymene , beta-myrcene, terpinene-4-ol, borneol , linalool , camphene, 1,8-cineole, trans-ocimene, camphor, geranyl acetate, 3-octanone, linalool, linalyl acetate, terpinen-4-ol, caryophyllene and lavendulyl acetate. Benefits : The various benefits of lavender essential oil are Bug Repellent, Sleep, Nervous system, Acne, Pain relief, Urine flow, Respiratory disorders, Hair care, Cancer, Blood circulation, Digestion and Immunity. Aromatic Description - Lavender Oil is floral, fresh, sweet, herbaceous and sometimes slightly fruity. It can be slightly camphorous. 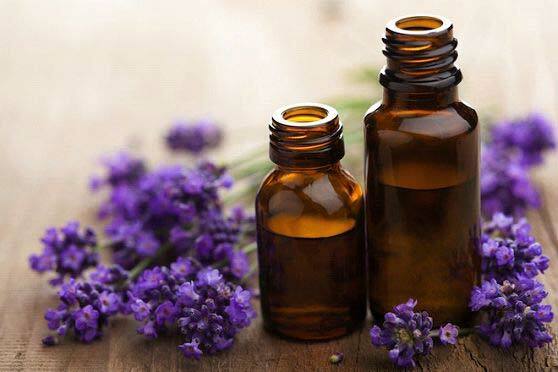 Lavender Oil Uses : Acne, allergies, anxiety, asthma, athlete's foot, bruises, burns, chicken pox, colic, cuts, cystitis, depression, dermatitis, dysmenorrhea, earache, flatulence, headache, hypertension, insect bites, insect repellant, itching, labor pains, migrane, oily skin, rheumatism, scabies, scars, sores, sprains, strains, stress, stretch marks, vertigo, whooping cough.